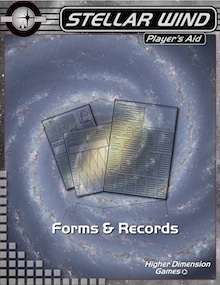 Forms & Records is a Stellar Wind Player’s Aid book. Player’s Aid books are small works that provide useful aids for both GMs and players. In this book you will find blank forms for recording character information, personal inventory (money, weapons, equipment, etc. ), spacecraft data, star system data and planetary data. You will also find an area map template you can use when you want to draw maps of specific hexes on your planetary data map.